Moving house can be a stressful ordeal. It can really get on top of you with selling the house, buying another one, packing and moving; as well ensuring the children’s school routines, after school clubs and homework are not interrupted. So can you imagine what it would be like to be doing all of these things at Christmas time, with the added pressure that you want to be settled in your new abode before Christmas Day amidst shopping for the kids presents and Christmas Day dinner. Robinsons International can ease the stress of moving, with their reputable expert packing team and quality removals service. And with prices at an affordable low, you can save some extra cash just in time for Christmas. Although usually you would love to have a white Christmas to play in the snow with the family, make snowmen, go sledge tobogganing and have snowball fights; snow can be a negative when moving house. It hinders your removal van to drive so to avoid getting stuck in the snow, salt your path way, drive way and outside pavement to ensure the removals team don’t slip when carrying your glass wear and belongings. Make sure you and the children have extra warm clothes to hand on the moving day, to avoid you all getting ill and irritated. Most weather conditions for the week are accessible online beforehand, so plan the moving day around the weather to shun the snow and make it as easy as possible. Also, staff numbers can be reduced over the holiday period so ensure to book with us in advance. And plan some of your Christmas shopping to ease the work load. Sometimes through all the moving chaos the little things might slip your memory. We have previously posted a moving guide check list, so you will know how important it is to contact your utilities provider. 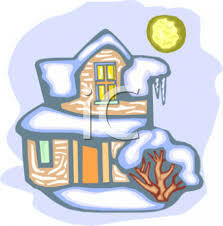 This is especially important when moving at Winter, to dodge having zero heating, hot water, gas or electricity. You can imagine the problems when you are trying to put up fairy lights on the tree and cook the turkey in the oven over Christmas if your utility provider cuts you off for not notifying them. Over the holiday period some local shops close earlier than usual, especially with the nights getting darker earlier. So be conscious that when you arrive at your new home you won’t have any food in stock and your nearest store may not be open. In which case, scout the area beforehand and get the number for the best local takeaway. It might be the last thing on your mind when you have moved but decoration is really important; for security, warmth and Christmas spirit. Most people thing the first jobs are to unpack and get settled but it is actually necessary to hang up the curtains to keep prying eyes away for security and warm the house up. Start getting the tinsel out around the tree and up the stairs and make the new house feel homely for the children to adjust quicker. Don’t forget what the season is all about; although the move can be challenging don’t miss out on the usual traditions your family do e.g. going to church or games night.